Last month, we celebrated Burns Night at home and at work. I actually made vegan haggis for sausage rolls to take into work, but then when we went the supermarket to do our weekly shop and I saw some vegetarian haggis reduced to half price. It expires on... so picked up two to eat during the working week. I also picked up some vegan 'Black Pudding'. I normally buy 'V Pud' by the Real Lancashire Black Pudding, but thought I try the Bury Black Pudding Company version to compare. 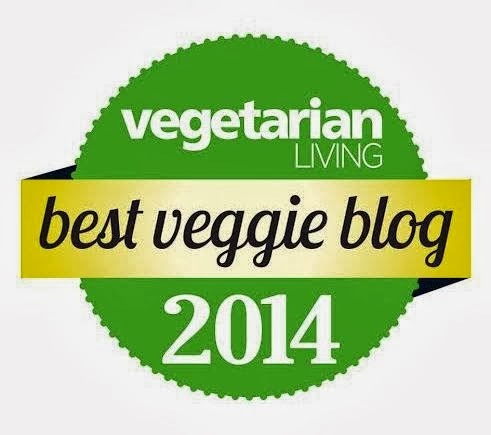 I had been participating in Veganuary this year, albeit quietly on my blog with not much of a mention. I noticed this year there was a more effort by mainstream supermarkets to stock their fridge and freezers; and well known famous brands with new offerings suitable for vegans. 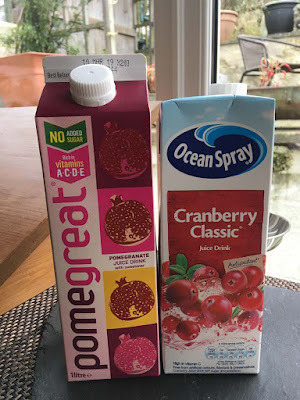 I avoided a lot of the new products like burgers, mac'n'cheese, pizza and curries as I can make them at home - top notch, but there are some things that I do not make that often at home; or simply greed got the better of me and I just wanted to try them. 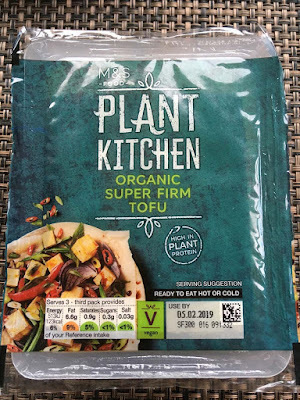 I tried a number of M&S Foods from the Plant Kitchen range, namely these No Pork Sausoyges and Super Firm Tofu. 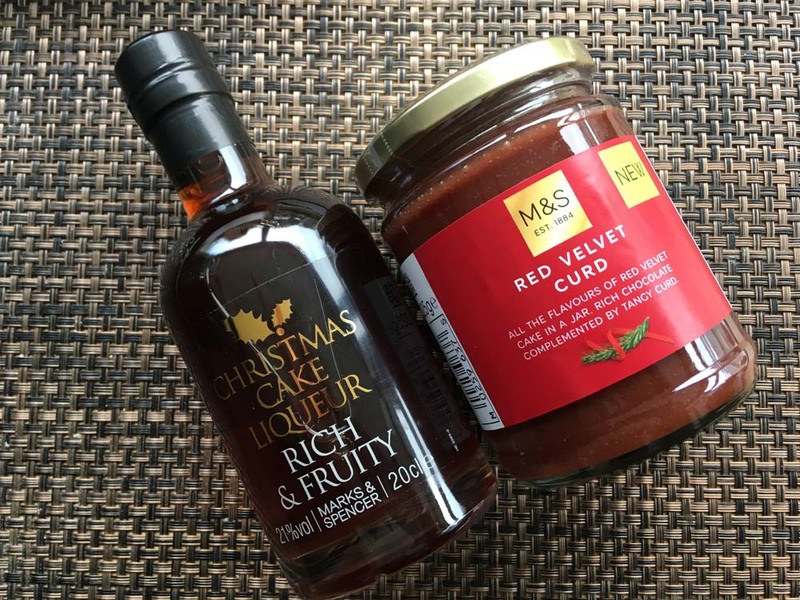 I found both fine, but nothing amazing to have me going back for more, especially as they are a little more expensive compared to other well known brands, and M&S is not a place I could afford to shop all the time. Whilst I was there I also picked up M&S Hoisin sauce as I had bookmarked a vegan Ribs and Peking Mushrooms recipe from The Superfun Times cookbook. 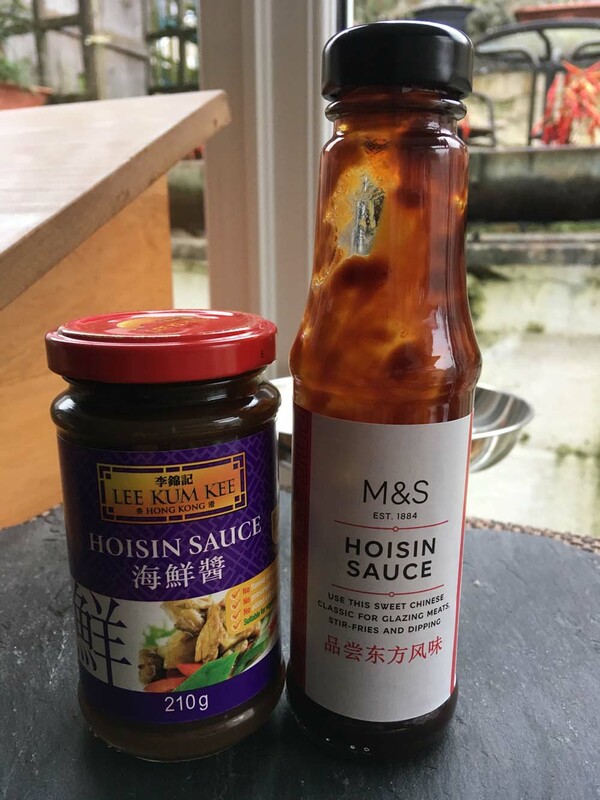 I picked up the Lee Kum Lee Hoisin Sauce from another supermarket. Its was interesting to see how different they both looked and tasted. 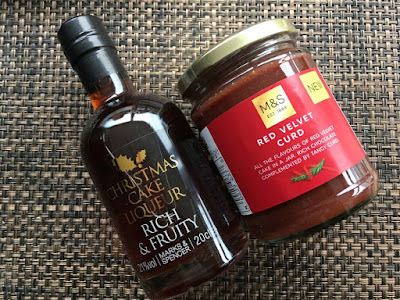 As I lined up to pay at M&S, they had a small selection of stuff left over from the festive period at reduced price: Christmas Cake Liqueur and Red Velvet Curd, which of course I got tempted and bought. 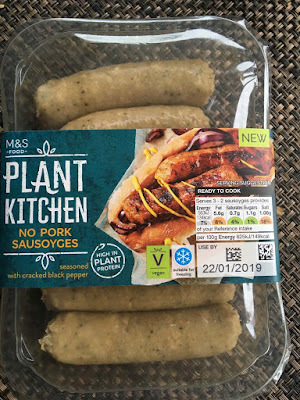 As I mentioned earlier, I was doing Veganuary last month and unusually we had a large amount of processed, fake and mock meat products in the kitchen. I have to confess this is not the way we normally eat and I will not start going down this route for a number of reasons...but here they as I wanted to share what was and is in my kitchen. During my lunch break, I tend to go to the fruit and vegetable market to pick up fresh fruit and veg, as a way to reduce plastic. But again with Veganuary in full swing I got side tracked by a number of mock ingredients all wrapped in non-recyclable plastic. 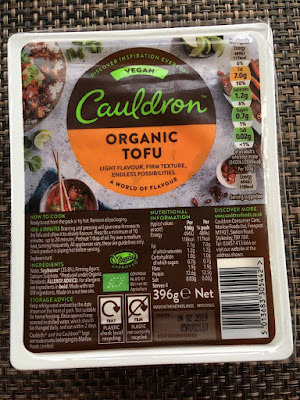 A fellow blogger said it well - the internal struggle between wanting to try new vegan food and it all being wrapped in plastic and none of it recyclable. This does not bode well for those of us trying to reduce plastic waste. So I will only buy in future what I really want to try and require for cooking. 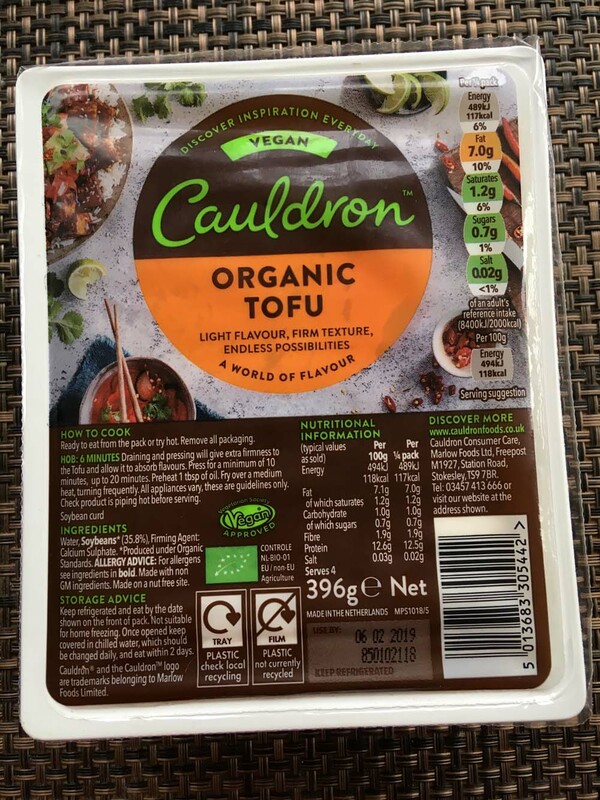 Alongside Quorn ham slices (not pictured) for sandwiches also wrapped in plastic, I picked Cauldron Organic Tofu for vegan Tofu Ribs recipe. I also picked up Vivera Veggie Steaks came from Sainsbury who also have their own vegan range called Love Your Veg. 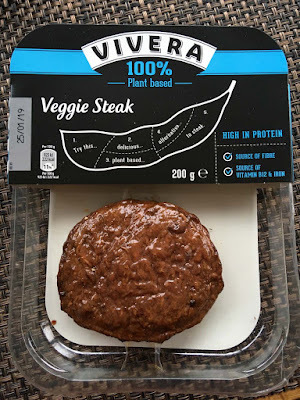 These Veggie Steaks are made with seitan were actually not to bad and had the texture and flavour. 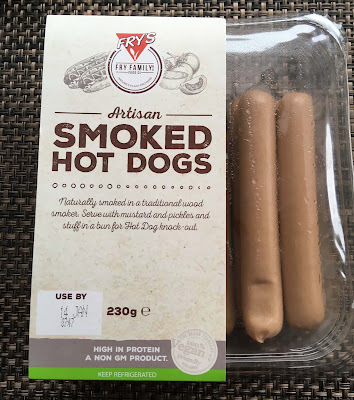 I also picked up these Fry's Artisan Smoked Hot Dogs and I must say I was not a fan of these at all. There was no smokiness and the texture was odd and slippery, I prefer the Quorn hot dogs for sure as more sturdy. 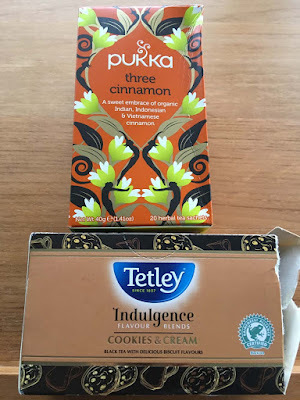 I also have some tea: Pukka Three Cinnamon which has been a nice change from the lemon and ginger; and Tetley Cookies & Cream. The Cookies & Cream was not my first choice, I prefer Tetley's Chocolate Mint but they did not have any this time. 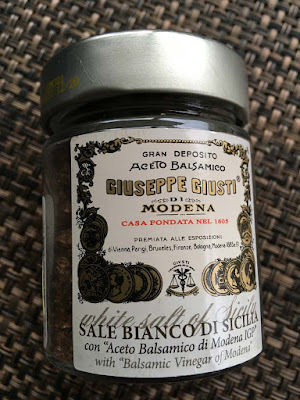 I am sharing this post with Sherry Pickings for In My Kitchen series, it was started by Celia at Fig Jam and Lime Cordial. 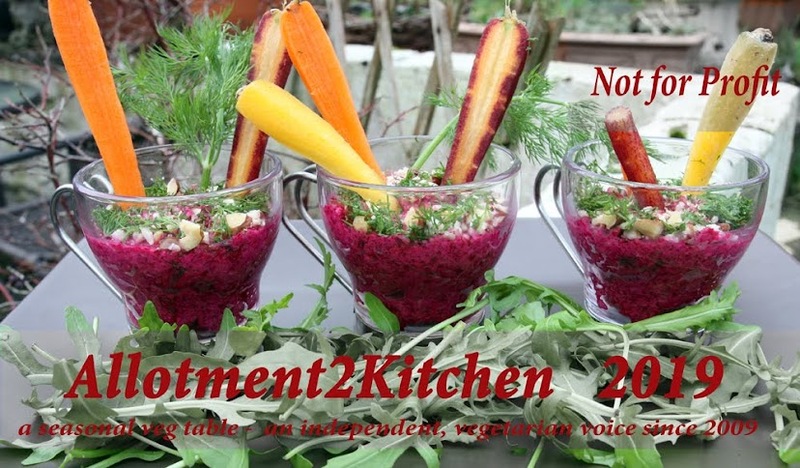 Its a lovely way to meet bloggers from around the world, as well as have a poke around in their kitchen. 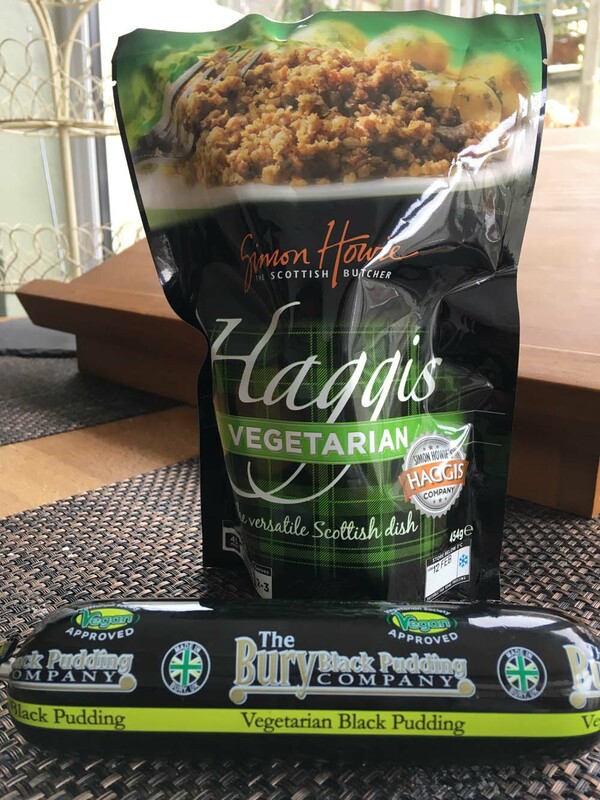 I've not seen that veggie haggis before and veggie black pudding! I know I wouldn't want it to taste like the real thing, so what does it taste like?! I tried some barbecue jack fruit last month. It was ok with the meal I had, but I'm surprised that a meateater could mistake it for meat (as I saw on tv the other day). Thanks Belinda, the haggis was actually quite good and surprisingly the one I made from scratch was also was good. I agree with your comment about jackfruit - how on earth could a meat eater mistake it for meat! Nice oven mitts! I just threw away my NEWEST one because it developed a big, unmendable hole in the thumb. No idea how that happened. 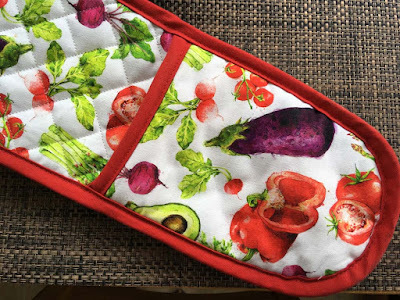 The veggie pattern is neat. All your fake meat is interesting. Thanks Mae. That is strange about the hole in your mitts, perhaps it wasn't sewn well to start with - such a shame. 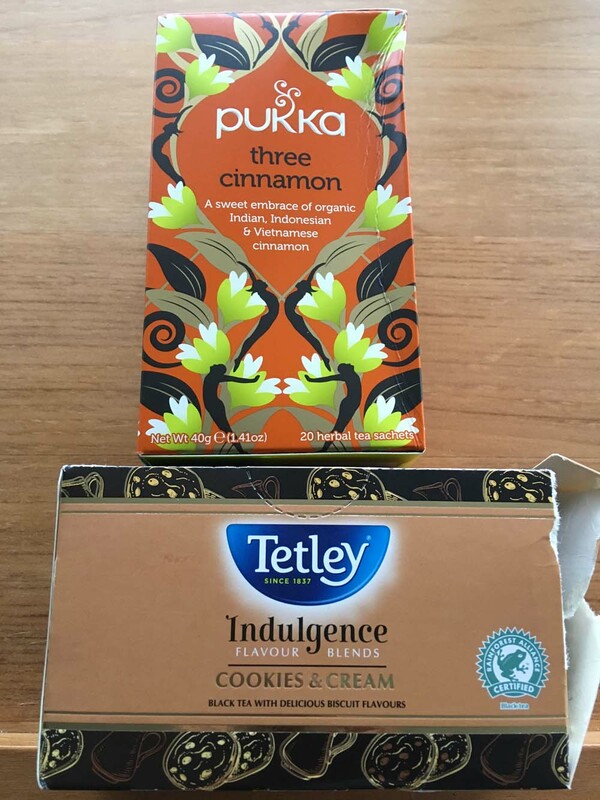 I would not mind the cinnamon tea but have grown weary of the endless array of veg alternatives to things. While I use a few, nothing beats fresh fruit and veg in themselves. Double oven mits are my favourite – much preferred over single oven gloves. I use them until the ends wear out! 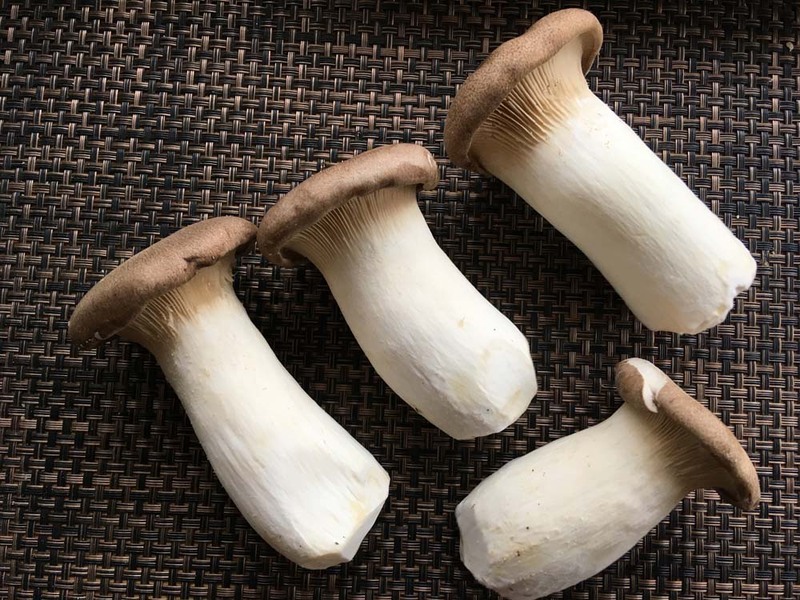 I wish we could get mushrooms like that here. They look so good. I must say those soysages don't look that appealing. I think I'd rather some more mushrooms! Wow so many new veggie products! I'm glad to see that M&S have a new range, but of course it's disappointing to hear that the quality wasn't so great. The mitts are cute and those mushrooms and rainbow carrots look great. Thanks VegHog. 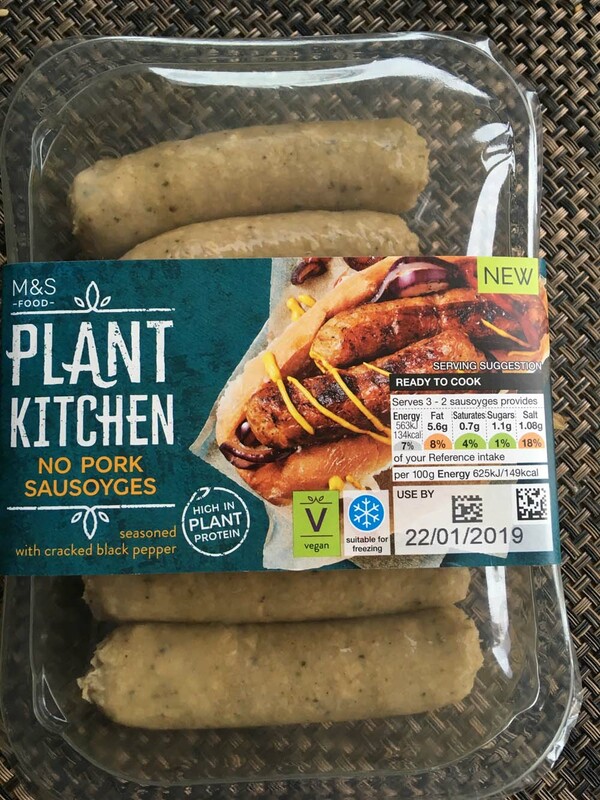 Yes M&S have been working hard in their kitchen devising vegan meals. 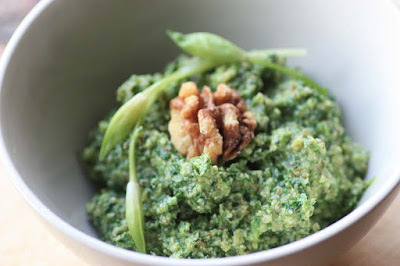 I'm fascinated by all the vegan/vegetarian products you can purchase overseas. It's getting better here in Australia lately, but still not the best. I love your oven mitt! For something that I use so often, mine is neglected and could do with replacing too. Lots of yummy things in your kitchen. I too struggle with the packaging of items. I want to eat all of the things, and I feel like if a company makes something vegan, I should at least support that so they know there is demand. Then I have to dispose of the packaging and I feel torn. 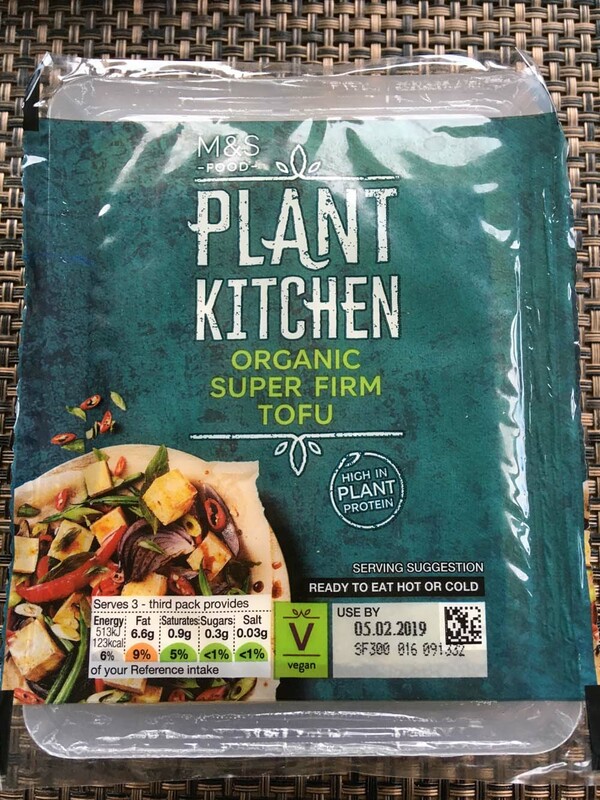 There are so many new faux meat products out there - it really is so much easier than ever before to eat meat free. Thank you Lisa. Indeed agree it is so much easier now to eat meat free. Thank you Sherry. Different flavoured sea salts feel like a luxury, but they do enhance some dishes for sure. I understand your reservations around mock meat, I know a lot of vegetarians that still avoid it. The red velvet curd is mostly chocolate - its selling itself as flavours of red velvet curd - the colour derived from radishes! So much interesting food here - I really want to find some balsamic sea salt. I love your bright clean oven gloves - ours look so shabby. 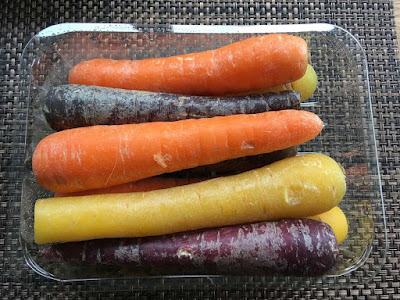 I know what you mean about plastic wrapped products - I try not to have too many but have been so busy lately that I have got into bad habits and need to get back to some simple home cooked food. I even forgot about burns night this year which I had meant to make haggis for but we enjoyed our haggis at new years. 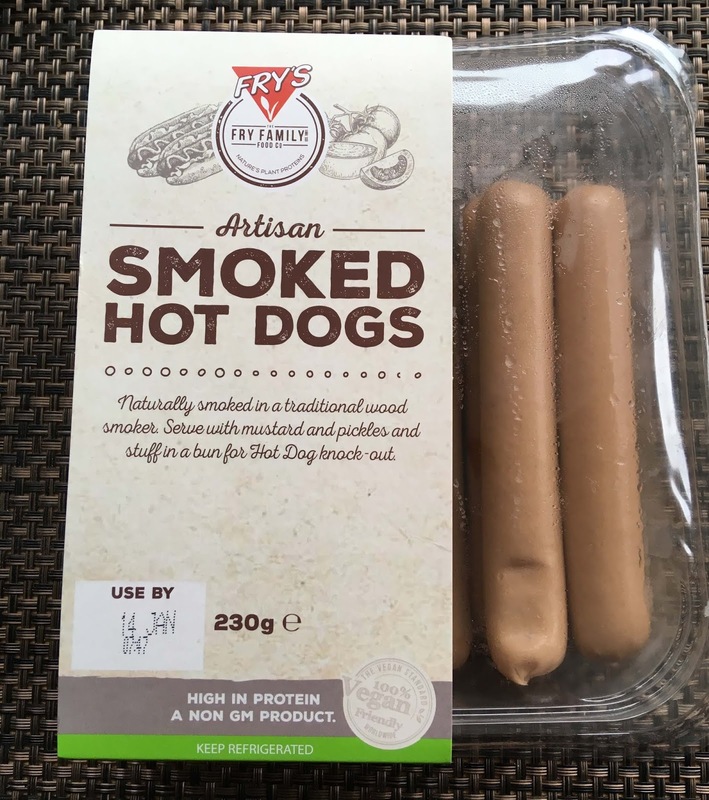 The fry's smoked hot dogs had looked promising as we like quite a bit of fry's products so I am sorry to hear they weren't so great for you. And I would love to have shops that sold vegan black pudding! Thanks Johanna. I loved the Tasmanian salt that you sent me, I used it for salads mostly and it was delicious. Its easy to get into bad habits with plastic for convenience, but I guess we all just need to make more of a effort and ask ourselves - do I really need this?! I am guilty of it too. Ah sorry to read that you missed Burns night, very unlike you, but I understand that you have been distracted and busy. I think the homemade Christmas liquer recipe that you had on your blog over Christmas would be superior, I found this ok.